Waldomerient "Waldo" Unfrundez felt the call of the Goddess when he was a child. Although his parents were not raised as believers, it was hard to ignore that fate seemed always on the side of small Waldo. When a huge fire ravaged all of their farm except the field where Waldo was praying, his parents had to admit that it was a miracle, and so the monks of the Sanctuary confirmed. When the soldiers gathered around the campfire boast of their exploits, Rolf smiles to himself. Any man can face danger, but when an executioner kills, he faces death itself. Death is his pet, his toy, his love, his joy. When Kirk the Jester tells his jokes, sings or dances, the other soldier laugh and clap. But when the cursed clown whispers tales of gore and tragedy, that's when Rolf laughs. 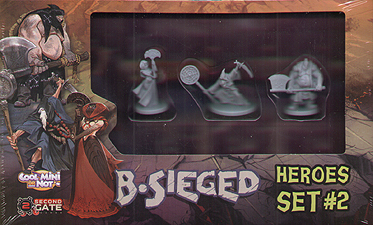 Requires a B-Sieged: Sons of the Abyss core box to play.